Surprisingly fast the city (to be fair remarkably green in summer) gives way to silver birch and pine forest. Slim trunk dark walls line either side the road, for long periods the world beyond the northern country’s forests just disappears. We could easily be in Finland, Canada or probably Siberia – until the trees part just a moment and you catch a glimpse of what lies beneath. The land, the meadows – the soil that grounds the National flag – have a gentler feel than Estonia’s Northern siblings. It’s a carefree pastor-idyll that does little to communicate the nation’s turbulent history. As we drift further south toward the country’s second (some would say culturally first) city Tartu, breaks in the treeline come more frequently, to be filled with hints of pre-soviet eras. We stop at one of these for lunch, a semi-restored manor-house serving for summer somewhat fine dining (more on that in a future post). These remnants of Teutonic ostsiedlung litter the countryside. Grand manors and extensive estates, once property of former Baltic-German nobility, since subject to as confused identity as the country itself. From soviet schools to state run heritage, the restaurant deal is simply symptomatic of the capitalist era – one such manor we pay visit to absurdly entertains an upkeep tithe whilst half the building sits already midst conversion to tawdry luxury hotel. For all its claim to cultural primacy, Tartu is not untouched by the same old identity crisis. A city c. 100,000 inhabitants, Tartu is dominated in spirit by its university. Established in 1632, its central building of Corinthian style in the fine and senseless tradition of such places, Tartu university is the strongest in the Baltics and rated amongst the top 3% (THE) in the world. This undoubtedly important institution lends the city all of its prestige and sophistication. From the moment of north entry via Tallinn-Tartu highway to the river that marks the classical southern edge, it is not easy to disagree with the town’s advocates. The air of educated, mature civilization transcends in its way Tallinn’s schizophrenic vivacity, an austere face of learning and history that leaves me a little cowed and humble. Yet cross the river and head to the self-styled ‘South Centre’ and the picture of superiority explodes. To be honest, there were hints – a single pair of gleaming blocks to signal the commercial spirit alive and well – but on the city’s edge the nadir of capitalist Estonia is reached and instantiated. Lõunakeskus in the home tongue is an ogre amongst malls, ice rink and army-truck diner come included, seemingly vast enough to house each and all of Tallinn’s unchecked many. It occurs to me that perhaps Estonia’s issue is one of forceful balance – the higher the culture the greater the excess of low-rent greed. Most southern of whistlestops is actually cross-border to Latvia. The twin towns of Valga and Valka, though only an arbitrary line apart, are of different worlds – language, architecture, genetics all change. 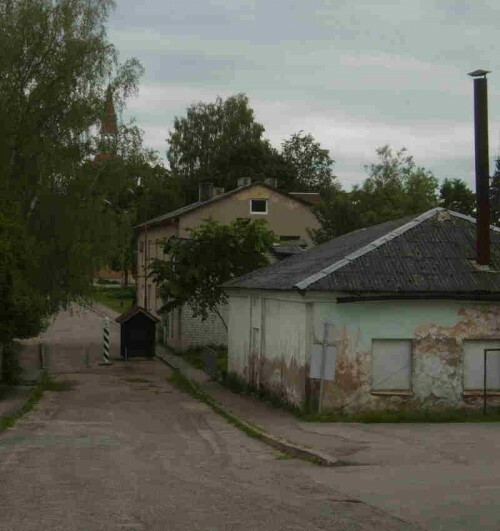 Though the bigger and better off recipient in the deal that drew the line, Estonian Valga is typical hinterland ghost-town, its wooden buildings in disrepair and streets empty. To cross the absurdly unimposing border-check is to cross in comparison to modern prosperity – or at least a world of well kept parks and still clad stone buildings. I make a souvenir of the worst beer I shall ever have tasted (I will redress the balance and document the perils and occasional joys of Estonian beer another time). 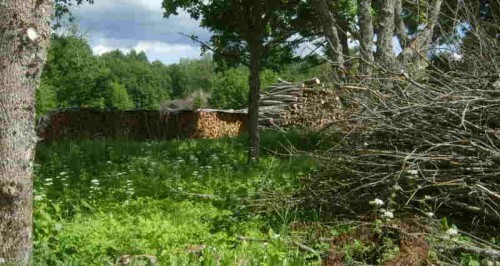 Sadly the disintegration of life in Valga seems too typical of much the Estonian countryside. Where areas do open for farming lands, even working plots show barns simply caved in, roofs lazily collapsed under age. 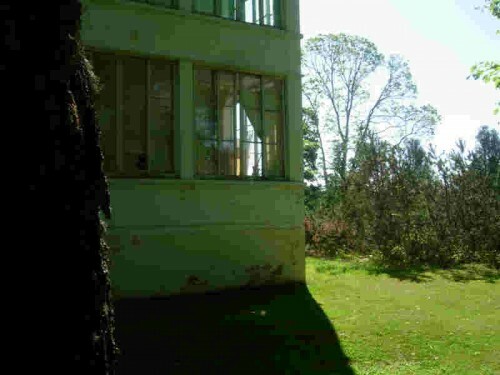 It is in the space of this dereliction that the most striking is rooted. Tinged with regret though the abandoned farms may be, they fit, part the natural cycle of the land – but equally hollow concrete blocks, futurism fallen short, mark of every town and settlement, are impossibly at odds with the pastoral surroundings. Hulking inhuman-dorms, monolithic warehouses, outbuildings factorized, the lasting and utterly alien memory of a great and foolish ambition. But the south remains the heart of Estonian pride – CCCP be-damned – and in a country 318m at its highest, its rolling hills (forest clad naturally – though of wider variety than the north) seem suitably grandiose to justify this role in history and on celluloid. The slopes also offer refreshing opportunity to see past the nearest treeline, a vista of all things, to instil in me my first and true connectedness.